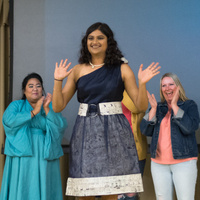 The Green Fashion Show showcases fashion pieces that have been created using sustainable materials, outfits that are created through up-cycling or more. This could mean that pieces are created from sustainable material such as: organic or local textiles, natural material such as plant matter, upcycled thrift store purchases, garbage materials, and more. Before and after the fashion show, you can enjoy free food, activities and shopping with local vendors. This event is part of Pacific's Sustainability Month activities.